Hi Readers! 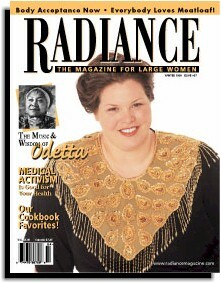 Included on this page are a wonderful assortment of exciting, bold, and colorful articles, fashions, essays, and photos from our Winter 1999 edition of Radiance. There's lots here for you to enjoy! Enjoy our Winter Issue. Remember, this is only a taste of what's inside the printed version of the magazine! In addition to ads for fashions for large and supersize women, mail order catalogs, and other important products and services, there is a whole lot more to read! Selected Radiance articles from our Back Issues, Sold-Out Issues, and Articles & Essays are available for your reading pleasure.